Crates are perfect for creating various furniture pieces with storage, especially for those who are new to wood crafting. 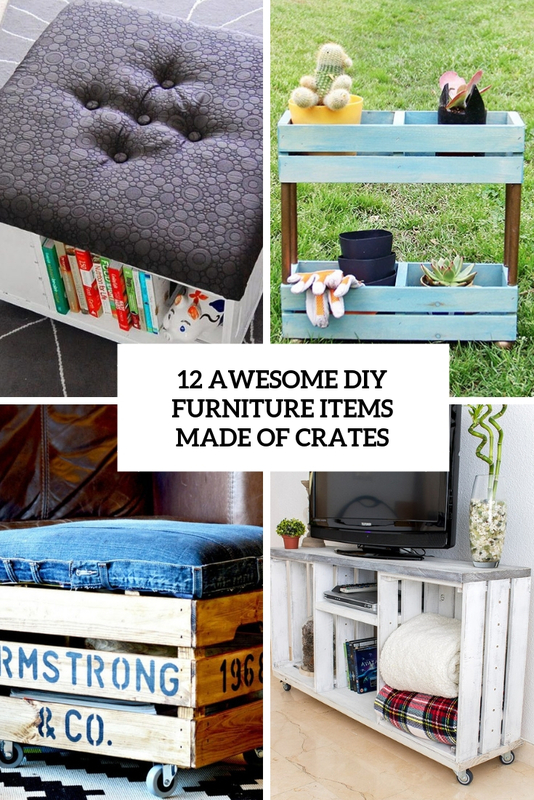 These crafts aren’t only about decorating and placing your crates on casters, you can really make comfortable items, and here are some tutorials you may like. 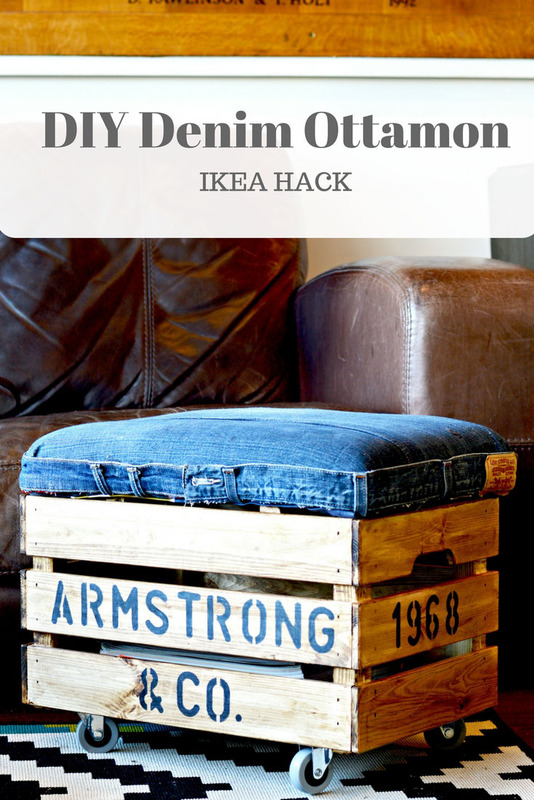 If you are about having a bit more storage and extra seating, this rustic denim DIY ottoman is a good idea. When unexpected guests turn up it provides both seating and somewhere to quickly hide clutter. The casters also make it really easy to move, and the seat is upholstered with old jeans that were stenciled to give the piece a personal touch. Watch it, if you have wooden floors, people will end up riding it around the house, and the wheels are really nippy. 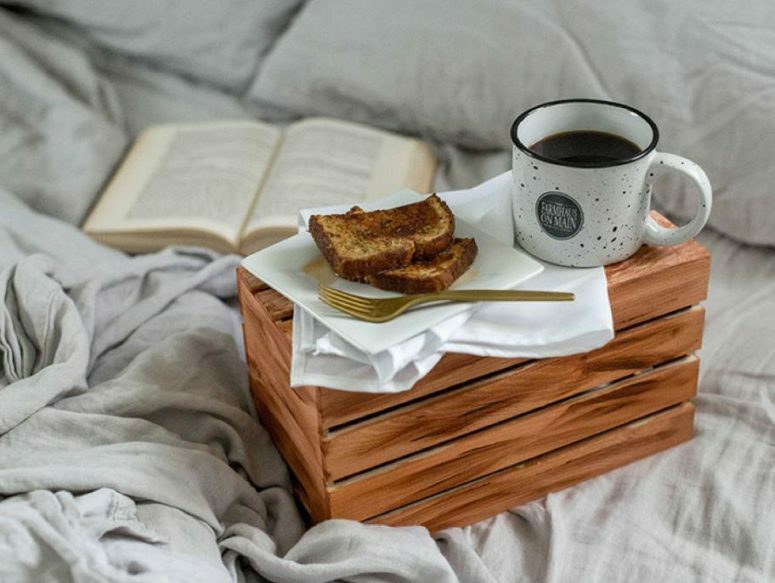 Okay, maybe this isn’t basically a piece of furniture but a cool stand or tray that can be used for serving breakfast, placing your jewelry or for many other things. 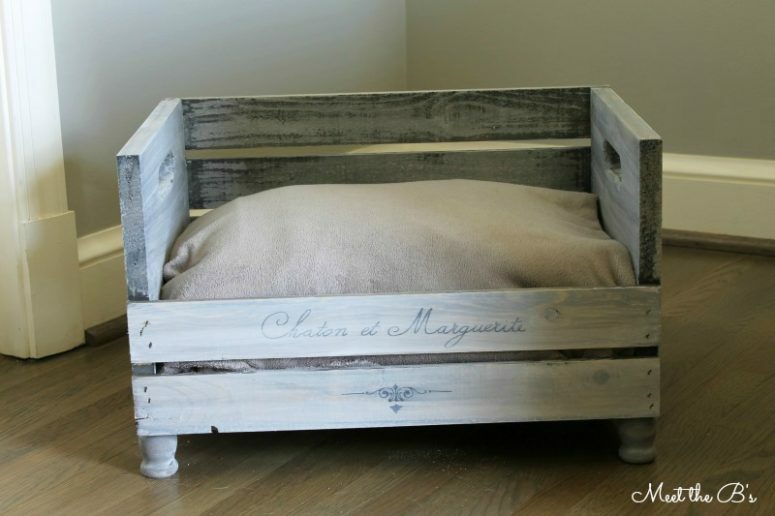 The author of the tutorial will tell you how to beautifully stain the crate to make it look wow. You’ll find out how to get the look of antique wood without smelly stain and gritty sandpaper. This rustic TV console table is so insanely easy to put together! There are no specific measurements for the project because since the base is a couple crates, the size may vary a lot from place to place. So, please remember that you can adjust each piece as you think fit. You can make it longer and just increase the size of long boards and the short board acting as a shelf. 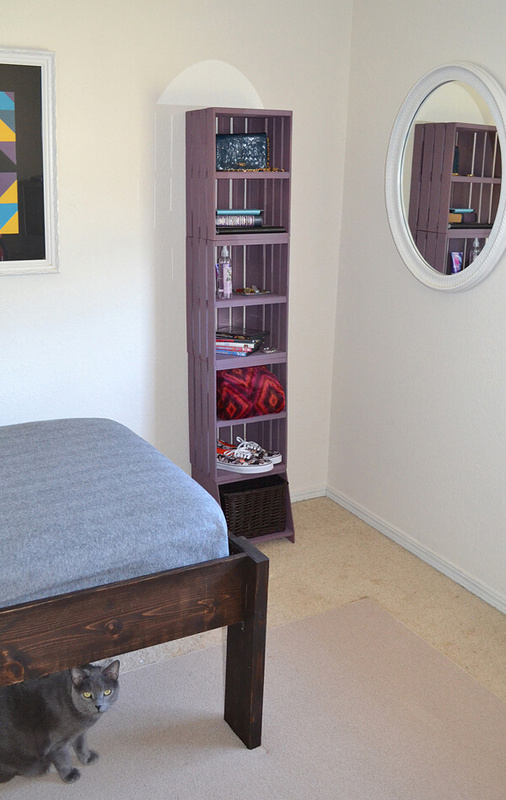 Get a chic old wine crate and turn it into a gorgeous nightstand! 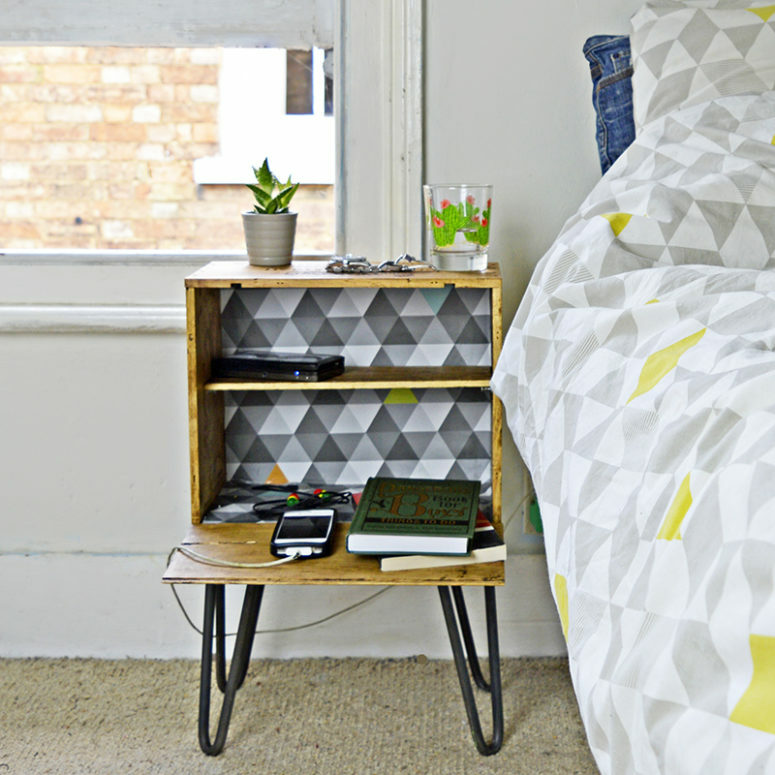 The nightstand looks awesome and gives a shabby chic feel to the space at once. Hairpin legs are great for transforming loads of things like crates, pallets and suitcases into tables. They come in loads of different heights and colors which only adds further to your projects. If you don’t have much space in your entryway, a floating piece is the best choice. This one is made of a vintage crate and with the use of pretty stencils that give it a vintage feel. The hinges on the crate are actually painted over and adding old hardware to any piece gives it a touch of authenticity. Read the tutorial and make the piece for your entryway. 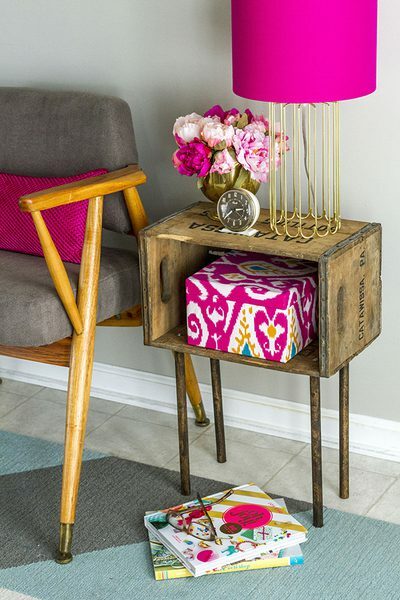 This wooden crate side table adds a rustic and vintage feel to your space at once. 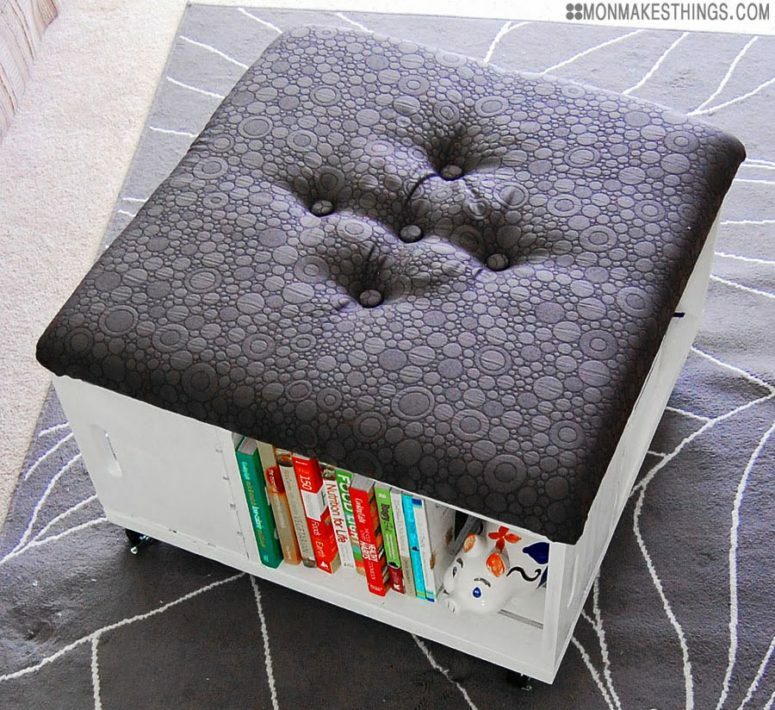 In just a weekend’s worth of time, you can make a piece of furniture that offers additional storage and decorative possibilities beside your favorite reading chair or your bed. When topped with a lamp, vase of flowers and other decor, you can transform an average crate into a beautiful showpiece. Need some storage space in the kitchen? No problem! 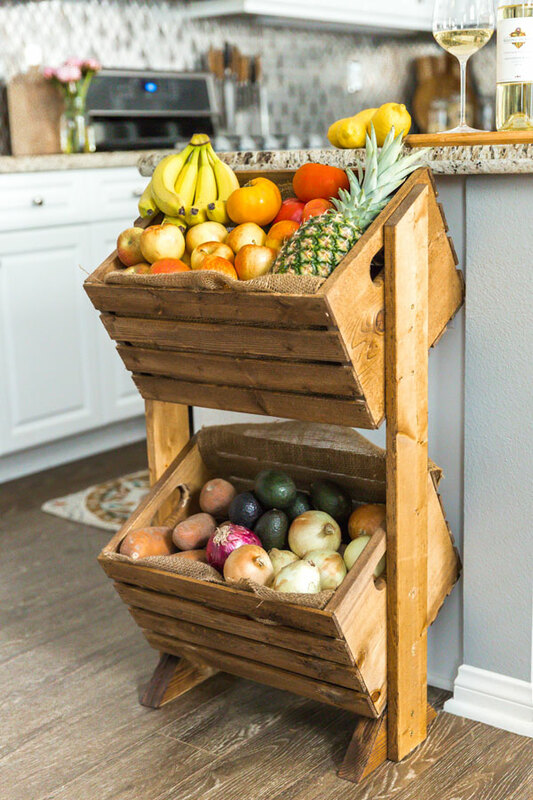 This DIY two-tier produce stand is actually quite easy to make and you don’t have to be a craftsman to build it! Access to a miter saw and a power drill and you’re good to go. You’ll save lots of time by grabbing a few pre-made wood crates, plus their ample size gives you plenty of room to store all your produce. There’s an extra boost of satisfaction when you build something yourself and see it get put to good use! 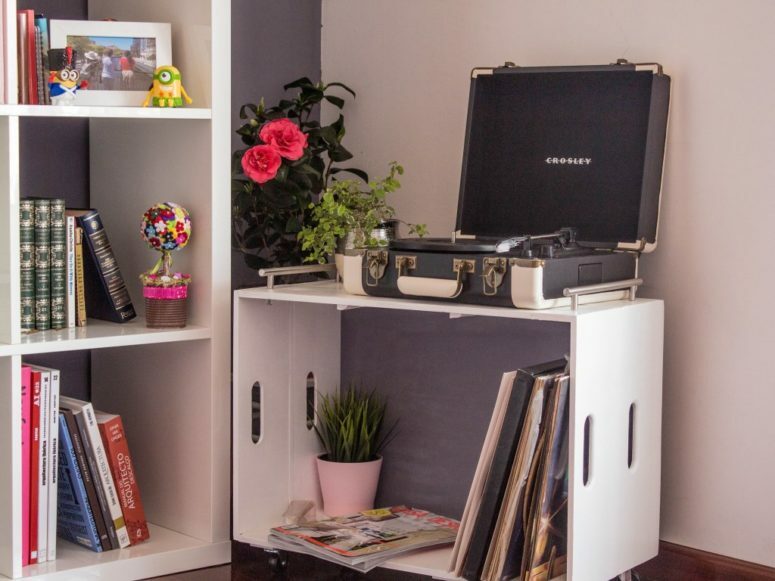 If you have a record player, you might be puzzling over where to put it. 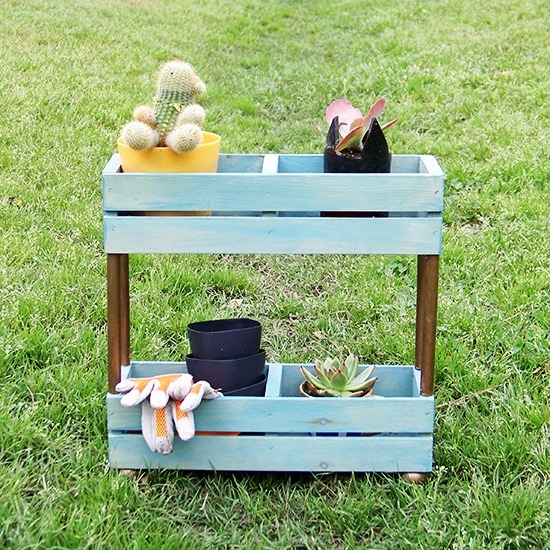 get some simple crates and DIY a proper furniture stand. DIYs look easier than they actually are; those single cube shelves should work as well; this DIY is on how to improvise when the supplies don’t cooperate, and you don’t have the measures you want. This exact tutorial is for pet owners, and it can work for a cat or small dog, or with a little more work, you could put several crates together for a medium sized animal. After you finish crafting, just add a comfy warm blanket or some faux fur inside the crate and voila – your pet bed is done! Let your furry friend enjoy it! This ottoman and coffee table is a stylish and functional furniture piece to rock. It’s made of several crates put on casters and features a comfy seat, which makes it practical – both storage and sitting is allowed here. Crafting it will take some time but it’s really worth it, so don’t hesitate to make one if you feel like making a storage furniture piece. Here’s a tiered garden shelf, which is ideal for many outdoor spaces and can be even repurposed into a bar or many other furniture items that feature storage. The piece is made of several crates and some wood for legs, paint them all as you like to fit your outdoor space and enjoy the comfortable furniture. This stylish wood crate bookshelf is tall and thin and can easily fit even a small spot. 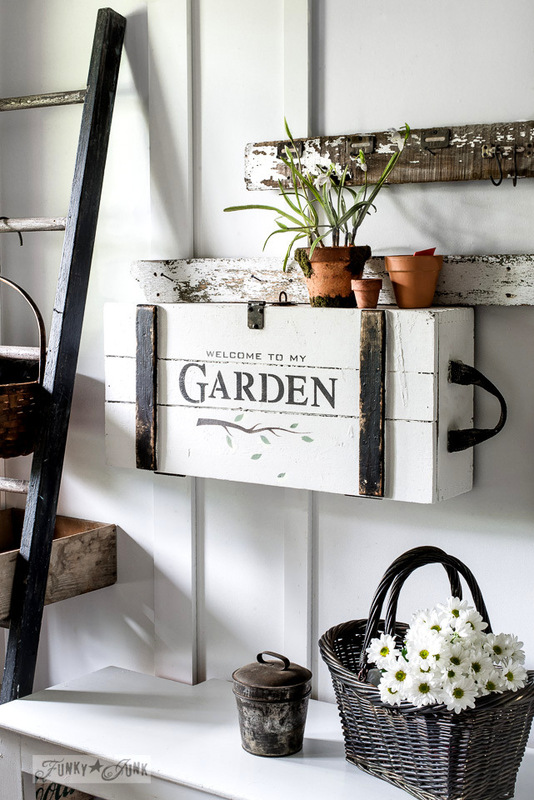 The piece consists of simple painted crates attached to each other, and that’s it – the craft is pretty simple and you won’t regret it for sure!